Having taken the lead over rivals WebMD and Everyday Health in some measures of patient engagement, Remedy Health is hoping a new-look website can help it further turn the tide in the portal wars. 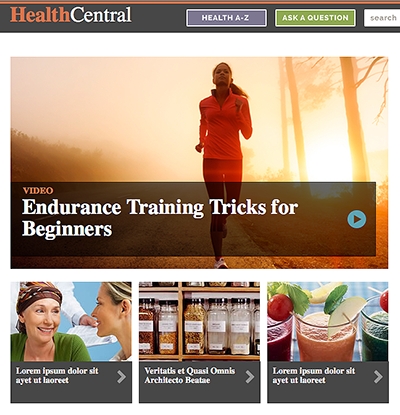 Remedy’s flagship site, HealthCentral.com, is scheduled for a major re-launch later this year incorporating what the publisher considers a more attractive design, friendlier site architecture, and other cutting-edge features it says are lacking in healthcare but are all too common among portals produced outside this industry (a prototype is pictured). The upcoming site, set to go live in the fourth quarter, will also feature responsive design enabling a consistent viewing experience across devices. Enhancements are aimed at boosting engagement with those whom search streams show make up Remedy’s core audience—real patients. Remedy already has a leg up when it comes to connecting with its target base. According to Manhattan Research’s Cybercitizen Health 2012 survey, it’s leading its two major rivals in terms of percent of users who use the internet to prepare for a doctor’s visit or when considering switching to a new medicine. Forty percent of Remedy Health Media visitors have gone online for health info or tools to prep for a doctor visit, the survey showed, vs. 36% of Everyday Health Network users and 26% of those on WebMD Network. Twenty-nine percent of Remedy Health Network visitors have gone online for health information or tools when they were considering switching to a different Rx drug, vs. 24% for Everyday Health Network users and 18% of WebMD Network users. Moreover, 85% percent of Remedy Health users said the web influenced a health treatment or service decision, vs. 73% of Everyday Health Network users and 66% of WebMD Network users, according to the Manhattan Research survey. In addition to several million monthly unique visitors, Remedy’s network of roughly 300 bloggers and patient experts contributes to the higher interaction rates. According to Omniture stats, 78% of users’ questions are answered by Remedy experts, and visitors are five times more likely to share content from one of these mavens than from non-expert community members. Remedy is less dependent on advertising revenue than its rivals are, having established a healthy sideline in subscriptions and licensing deals with health plans and hospitals. With longtime partner the University of California-Berkeley School of Public Health, Remedy launched a health and wellness platform—BerkeleyWellness.com—in February, leveraging the relationship. A dozen or so in-house Remedy editors also collaborate with The Johns Hopkins University School of Medicine on content.